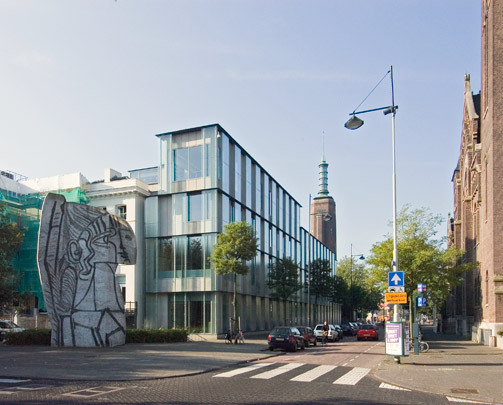 The demolition of a villa on Westersingel enabled the Boijmans Van Beuningen Museum to expand as far as Rotterdam's 'cultural axis' with a new U-shaped wing. Designed by the Belgian architects Robbrecht and Daem, it enfolds Bodon's distinctive gallery. In the museum's new configuration the library looms large as a provider of knowledge. The big windows and green transparent panels of the new portion contrast with the brickwork of the original buildings.